Help us build two wells for two amazing communities -- and help show the world what word of mouth can really do | Andy Sernovitz | Damn, I Wish I'd Thought of That! Word of mouth can change the world. It makes companies better. It makes industries better. It makes the world better. It can even build 20 wells, in 20 communities, that can forever change the lives of 5,000 people. 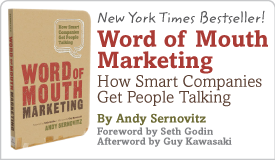 It’s this kind of world-changing, business-bettering, you-can-do-it word of mouth that we’ll be talking about on July 20th in New York at Word of Mouth Supergenius. Because we’re bringing together so many amazing marketers, we wanted to use the opportunity to do something meaningful — something world changing. So, we’re partnering with charity: water — one of our favorite organizations (and one of our amazing presenters) who is using the power of recommendations and referrals to bring clean, safe drinking water to developing nations. Using word of mouth, we’re going to raise $50,000, build 20 wells, and forever change 20 great communities on the other side of the world. Make a donation. A dollar, 50 dollars, a thousand — anything. Every penny you donate goes directly toward building a well. As little as $20 can give one person clean water for 20 years. Donate your discount code. 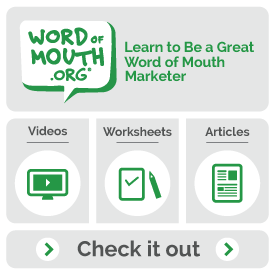 If you’re registering for Word of Mouth Supergenius using a discount code, you can donate it to this cause with one click. Talk about this project. Blog it, tweet it, post about it on Facebook, tell your friends. The more people involved, the more change we can make. And if you can make it, we’d love to see you at Word of Mouth Supergenius this summer where you’ll learn more about how word of mouth can change your business — and the world — forever.